Smithereens: DeNami December Blog Hop! Hello! And welcome to another DeNami Design Blog Hop! You're almost at the end of this fabulous hop -- haven't the projects been SO inspiring? Hopefully, you've come here from the fabulous blog of Pam Wendt! Aren't her projects so beautiful? =) Don't forget to leave a comment on each blog for a chance to win a DeNami Gift Certificate! I used a glitter pen and some glitter and scor tape to add the glittery details! =) I Hope you like my project idea! The supplies are listed below! Ok well it's time for your LAST stop on this blog hop! It's time to visit one of my absolute favorite bloggers, Ayana Posadas! I know her project will be just fabulous! =) Have fun hopping! 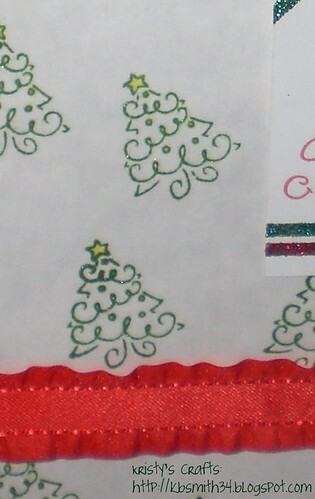 Love your fun little tag and the cute ribbon added to the bag goes perfectly with the small curly Christmas Tree! Great bag and tag- love the glitter! This is just absolutely darling! Love your ribbon trim, and that glittery tag adds the perfect finishing touch! Great tag and bag combo! This is ADORABLE!! Those curly Christmas trees always make me smile! I LOVE how you used the scor tape with the glitter, too! Serious WOW factor! Love the tag trimming...great idea and the bag is ohh so adorable! super cute bag and tag tfs!! These bags are super cute! Thanks for sharing! Super cute! Love the tag! Love your decorated bag and the gift tag. Thanks for the close-ups. The stamps are too adorable! Lovely presentation! Gosh seriously that puppy stamp is like my ultimate favorite!! Great use of it too! I love the bag! 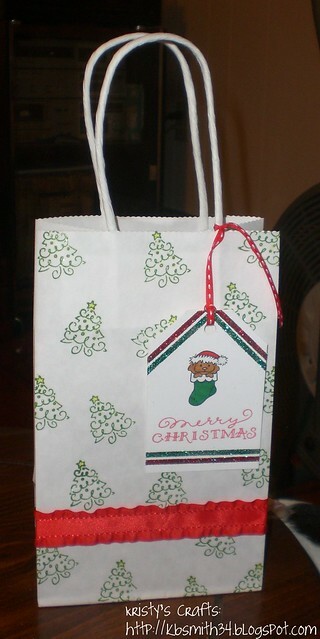 Kristy, this gift bag & tag is so darling! Love the glitter detail you added to the tag- it looks fabulous! That is such a sweet gift bag, Kristy! Cute tag and fabulous ribbon trim. Amazing! Sweet gift bags! Cute tags too! Very cute--I like the glittery details. Super duper cute gift bag, Kristy!! 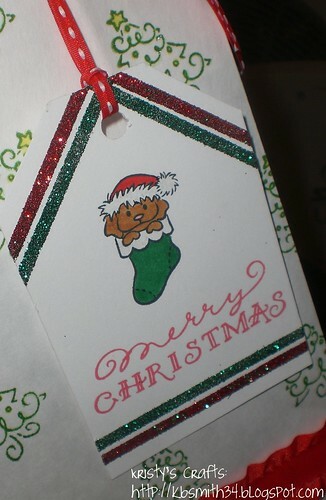 I LOVE the glittery strips on the tag and that ADORABLE little puppy in a stocking!!! And those curly trees with touches of sparkle are FABULOUS! !